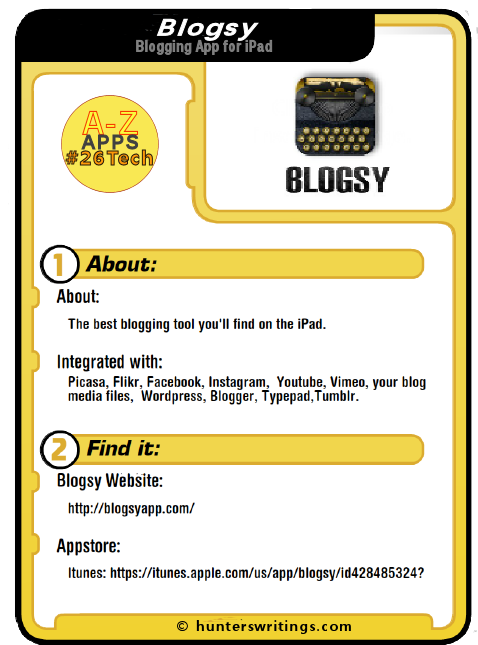 The B post for #26Tech A-Z Challenge will preview Blogsy, a blogging app for the iPAD, with inbuilt multiple blog platform, image and video capabilities; and markdown support. 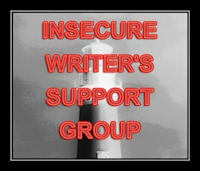 As this app is also relevant to many writers, consider this post also part of the monthly #IWSG – Insecure Writer’s Support Group posting schedule. 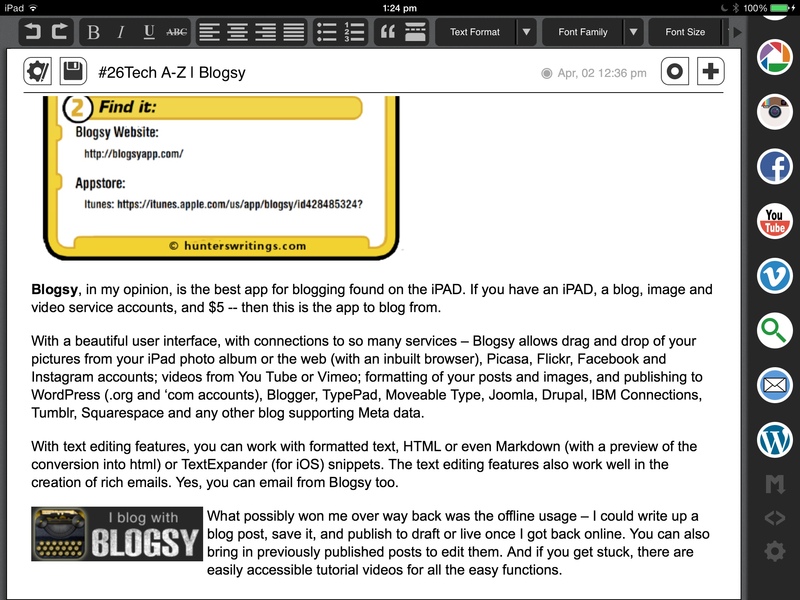 Blogsy, in my opinion, is the best app for blogging found on the iPAD. If you have an iPAD, a blog, image and video service accounts, and $5 – then this is the app for you. Blogsy allows drag and drop of your pictures from your iPad photo album or the web (with an inbuilt browser), Picasa, Flickr, Facebook and Instagram accounts; videos from You Tube or Vimeo; formatting of your posts and images, and publishing to WordPress (.org and ‘com accounts), Blogger, TypePad, Moveable Type, Joomla, Drupal, IBM Connections, Tumblr, Squarespace and any other blog supporting Meta data. 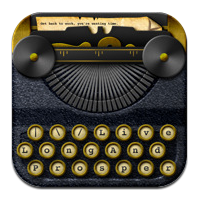 Text editing features work with formatted text, HTML and Markdown (with a preview of the conversion into html) or TextExpander (for iOS) snippets. The text editing features also work well in the creation of rich emails. What possibly won me over way back was the offline usage – I could write up a blog post, save it, and publish to draft or live once I got back online. 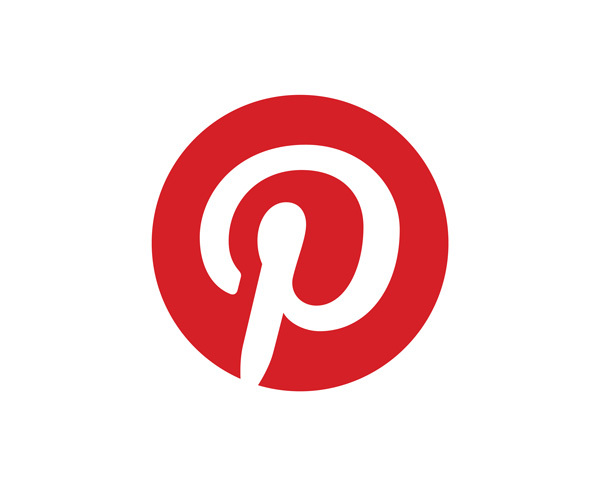 You can also bring in previously published posts to edit them. And if you get stuck, there are easily accessible tutorial videos. #26Tech: This was the B post for my A to Z challenge, where this blog will be posting 26 days worth of Tech posts relevant to writers and creatives. Wow Hunter, this app sounds fabulous. I will give it a try. Thanks for yet another great techie tip. I’ll have to download and try it – thanks! This sounds AWESOME! Unfortunately, I don’t own an ipad… oh well. Lol. Stopping by from the A to Z!